What Are the Different Types of Hot Air Balloon Baskets? Hot air balloons are often made from wicker. A hot air balloon basket, or gondola, is the basket that carries passengers. These can be made from a few materials, including wicker and cloth. They may also only be big enough to carry a few passengers, or large enough to carry several. Special hot air balloon baskets are also manufactured for special flights, like races and extended flights. Wicker is typically the most common and traditional material used to make hot air balloon baskets. This basket material is lightweight as well as durable. It will also absorb some of the shock when the balloon lands. Metal and fabric can also be used to make hot air balloon baskets. A framework made from very lightweight metal is typically built first. A durable fabric skin is then placed over the framework. These types of hot air balloon baskets are usually more lightweight than traditional wicker baskets. Some of them are even collapsible, making it much easier to transport the balloon and basket. Hot air balloon baskets can also be made to accommodate certain number of passengers. Small balloon baskets can obviously only carry a few people. This would include the pilot and maybe one to four other passengers. Very large hot air balloon baskets are also available, and these can be used to carry several people. Since any added weight can cause flight problems, however, very large groups of people do not usually ride together in one basket. Large balloons with large baskets will usually carry no more than 30 people at one time. If the basket is overfull, the balloon may have difficulty taking off or staying afloat for the entire duration of the ride. Sometimes, partitions are added to larger baskets. These allows the bigger groups of people to be separated. The pilot, for example, may occupy one small section, while the passengers occupy another section. Some hot air balloon baskets also have a small partitioned section for extra fuel tanks or other necessary equipment, like fire extinguishers. 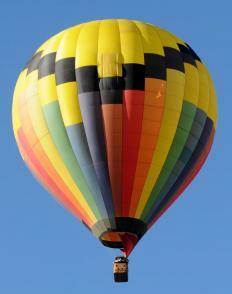 Specialty hot air balloon baskets may also be needed for certain types of hot air balloon flights. Pilots participating in a hot air balloon race or competition, for instance, will typically want a small lightweight basket. Any added weight during these types of flights could slow the balloon down or make it hard to maneuver. Pilots attempting extended flights may also opt for special hot air balloon baskets as well. This can include crossing oceans or even around-the-world-flights. An enclosed basket, for instance, can help protect the pilot and any passengers from the sun and any inclement weather. Who Were the First Passengers in a Hot Air Balloon? What Are Hot Air Balloon Races? What Should I Know before I Buy a Hot Air Balloon? What Factors Affect Hot Air Balloon Prices? How Do I Make a Hot Air Balloon? What is a Weather Balloon? Are Hot Air Balloons Safe? I saw a how air balloon for sale on on Craigslist recently but it did not include a basket. It was only the balloon and the torch for making the hot air. I didn't buy it then but it is still listed and it has been in the back on my head ever since. Lets say I did buy it. First, where do you buy a basket for something like that? Second, what are the laws about taking it up in the air? Do you need to get clearance or have some kind of license? They had hot air balloon rides at a carnival I went to recently. The balloon was tethered to the ground so you only went about 75 feet into the air. It looked fun but I was really hesitant to get on because the basket looked so rickety and they guy running it looked like he left his brain up in the sky. What is the maximum number of people that can fit in the basket of a hot air balloon? I have a family of 8 and I think it would be really cool if we could all take a hot air balloon ride this summer. A buddy did it with his wife and kids and they had a blast, and it was not as expensive as you would expect. But my family is a lot bigger than his. Will we all be able to fit?